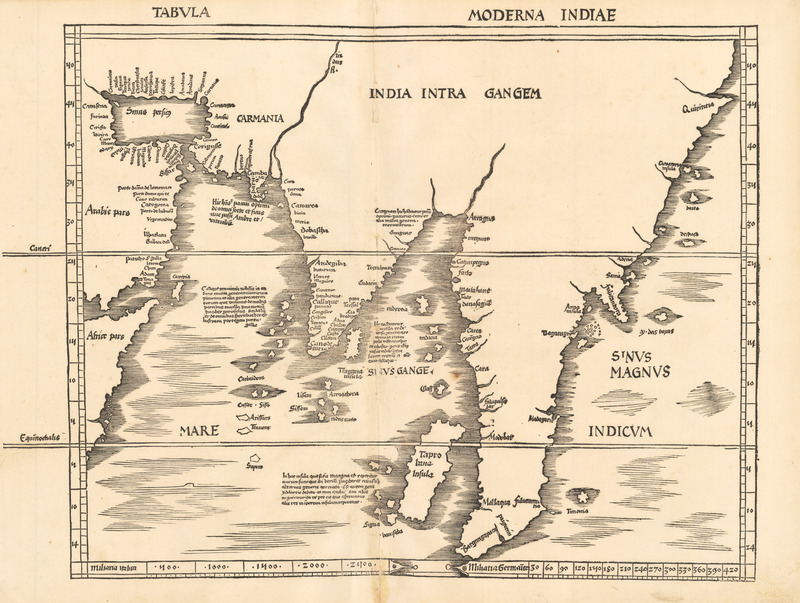 This early and rare woodcut map is thought to be the first modern printed map of Asia. This example appeared in Geographia opus novissima traductione e Graecorum archetypus castigatissime pressum, the edition of Claudius Ptolemaeus’s atlas. It is said to have been influenced by information gained from an Italian who bribed a Portuguese cartographer. The map depicts the Indian subcontinent, Malay peninsula, and southeastern coast of China, in addition to showing the Persian Gulf, the southern Arabian peninsula, and the tip of the Horn of Africa. West of the Malay peninsula in the area of Sumatra is an island labeled Taprobane, a term more associated with Ceylon; Ceylon appears in this map as a separate island off the southeast tip of India. The lines marking the tropic of Cancer and the equator extend beyond the left margin. Coasts are shaded with parallel horizontal lines. Condition: Map is in good condition displaying a dark impression on clean, thick paper with wide margins. Some worm holes and minor discoloration and rust spots apparent near the centerfold.